I hope my horses are happy. I gave up my new front yard for them. We've lived in the middle of this old corn field for six years. Each of those years Hubby promised me a new front lawn. That lawn always gets knocked down a notch on the to-do list when those other random farm projects pop up. This is it. This is the week that I was supposed to definitely get my new lawn. Guess what? Not gonna happen. But that's OK with me. We were going to do the lawn and the back pasture. Then some things happened that made us rethink the investment. We decided we should only do one or the other. I picked the pasture. Yep, me. My horses rank pretty high on my priority list. 'nuff said. Hubby had already sprayed the pasture, killing all the grass and weeds that were growing there. Here is Hubby on our tractor tilling all the dead stuff under and loosening the soil. Hubby has a part-time job in the summer working for Mark's landscaping company in exchange for grass seed and fertilizer. It's nice to have friends with heavy equipment! This is Mark's harrow rake. He uses it to smooth the tilled ground. Mark has a really nice tractor. I'd love to have an enclosed cab! When I sell my book, a bigger tractor is on my list. (I know... I dream big.) 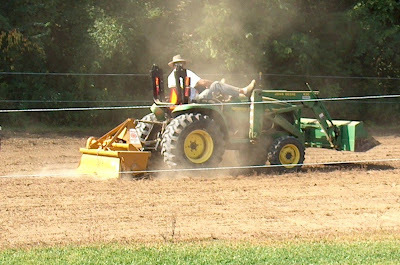 This is Mark using the harrow rake to smooth the pasture, getting it ready to plant. Hubby took the tiller off and installed Mark's seeder. 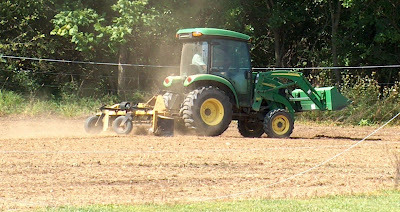 This is Mark on our tractor, spreading the grass seed and then the fertilizer. The best time saver of all... This is Mark's straw blower. Hubby is just getting over a bug, so he gets to drive Mark's truck. A friend volunteered to cut open the bales and heave the straw to the blower. Now that's a real friend! The boss is operating the blower. I am a safe distance from the mess, using my zoom while standing on the bedroom deck. It makes me want to gasp for air just looking at this picture! So now the field is ready, but the weatherman said it will be dry for several more days... Come on rain! So glad you're getting your pasture, but so sorry the lawn is on hold. I'm always having to choose priorities on my to do list also. It seems like the "to do" list grows faster than the "done" list. Congrats on your PIP. Progress in Pasture. You are so lucky to have such good friends to barter those trucks, that's a big lot to tend and you can't just do it using bare hands! It will take ages before you finish the pasture. Good job and nice to see you blog on this blog! Good friends with heavy equipment really do come in handy for this kind of a project. It may not be a lawn but it will be a green pasture with some beautiful horses, that's not a bad thing. I am glad you are getting the pasture and hopefully one day you will get your front lawn. You will have many hours of enjoyment watching the horses in the pasture and you will know then that it was worth giving it priority. I'd pray for rains to happen soon. Do you know that in rural India, people get donkeys married in a ritual to please the gods of rain! I know, that's ridiculous. Just wanted to share an information. I am totally green with envy. lol All that equipment is the way to go. And, I understand completely how the lawn always ends up behind something else. Needless to say, we are such suckers for animals. Do we EVER need pasture work as well as lawn. 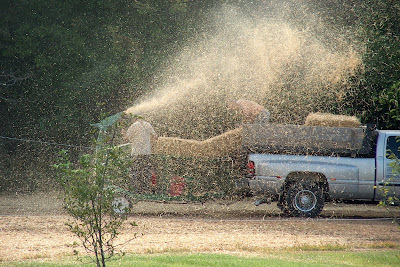 It rained here last week, thank God; and yep, hubby and I were sloshing in the rain spreading winter rye by hand in the pasture and on the "lawn." The rye is coming up already! If it rains this weekend as somewhat predicted, we'll be at it again. 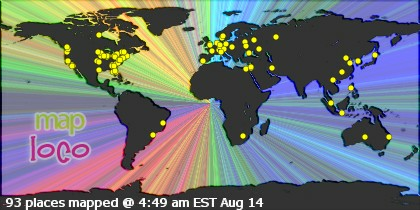 Take care and I want to see pictures when it is all green. You are very nice to give up your front lawn for the pasture. I know Nekoda, Buddy and Maggie love you for it. That was interesting and I am glad that hubby has access to the equipment. I am also glad you stayed inside. I can't imagine your poor lungs out there with all that stuff blowing. How is Lexi doing? Ive gotten kind of behind in my blogging duties, but I must say it's so nice to come over to your farm and read the comments left by my OTHER friends. My allergies began to act up just looking at those pictures! Isn't it time for RAIN? We are getting some here right now. great.. your friends are soo nice! im enjoying your life! 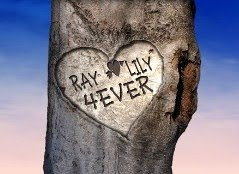 I agree with my fellow Indian here,they do get donkeys married to bring in rain.I learn about farm life here and also at the wooverine farm in Alaska..it's family run and huge.Thanks Lily for your warm words it's much appreciated.Enjoy!